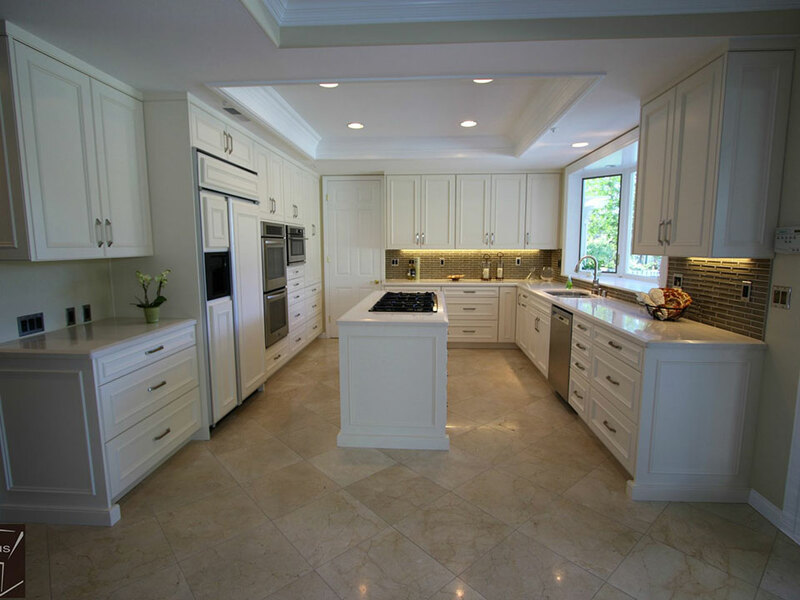 The APlus team was called upon by the owners of a Coto de Caza home to perform a full-scale kitchen renovation. Originally, the kitchen had standard cabinets that didn’t make the best use of the space available. This lead to problems with awkward storage arrangements. The owners requested that we build custom cabinets that not only enhanced the beauty of the kitchen, but also maximized the storage options available and made working in the kitchen far more practical. The floors were laid with beige colored stone tiles in a diamond-pattern, creating a foundation of subtle texture and neutral hue. 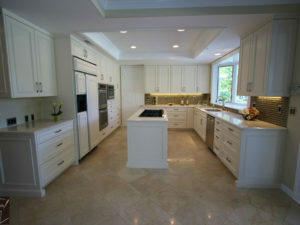 Upon that base we began to build the new custom cabinets in a U-shaped layout that hugged the walls of the kitchen. We constructed the cabinets out of maple wood in a traditional style, with Flat Beaded Edge crown moulding. The sleek Royce stainless steel handles allow for a blend of classic and modern design that results in a transitional look for the entire kitchen. We outfitted the cabinets with many stacks of drawers to provide various sorting and storage options. Corner cabinets have fold-out doors and built-in lazy susans, which come standard every APlus kitchen renovation. The undersides of the cabinets are augmented with light rails, providing more illumination for the pristine white stone countertops. This lighting also draws attention to the narrow earthy gray tiles applied to the walls as a stylish backsplash. On the ceiling, the recessed portion is trimmed with its own moulding to give a tidy, sophisticated appearance. The recessed lighting here incorporates even more modernity. In the middle of the kitchen we built a slender island to provide more workspace. It has multiple drawers and shelves. 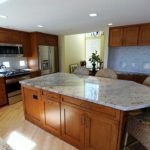 After all of the materials and cabinets were in place, the remodeled kitchen boasted a new look that was fresh, bright, and beautifully simple. 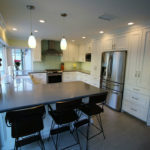 In keeping with the transitional design of the the kitchen, the owners opted for primarily stainless steel appliances. Beneath the bay window there’s a double-bowl undermount sink, next to an undercounter dishwasher. On the other side of the kitchen, a double-oven and a microwave are housed among the cabinets. The refrigerator is faced with the same materials as the surrounding cabinetry, while the 6-burner rangetop on the kitchen island sports a glossy black finish. If you are interested in having your Orange County home updated with a kitchen remodel or other type of renovation, contact us today. APlus handles all types of renovations, and services all neighborhoods in the area.